In Purity III, we add additional parameters - extra fields. These are the how-to steps in adding extra fields in Purity III. In this writing, we will represent steps to adding extra fields used in Portfolio page. Create extra field group by adding portfolio.xml file. Define extra fields in the created portfolio.xml file. Adding style for extra fields. Assign extra field group in Joomla category content - Portfolio category. Create a portfolio.xml file in templates/purity_iii/etc/extrafields/. The .xml file is to declare extra fields for Portfolio content type. <field name="portfolio-state" type="list" default="" label="Special State"
You can add style for each fields in any .less file in templates\purity_iii\less. In Purity III, style of extra fields used in Portfolio layout is stored in portfolio.less file in templates\purity_iii\less\layouts. Step 3: create content category. Create a content category name Portfolio. In the tab Extra fields, select Portfolio for option Extra field group. When create an article, after assigning to Portfolio category for this newly created article, these extra fields then appears under the tab Extra fields. Purity III provide a variety of custom layouts for Joomla com_content such as: Blog, Magazine, Portfolio, Features Intro, Glossary, and etc. These layouts mainly use the default article content type, except the Portfolio layout, which uses the additional extra fields: Special of state and Demo link apart from all the original field from a standard article. In this writing, we will represent the process of creating Portfolio layout, an overridden layout from Joomla default layout. We put the step into an independent section because it can be used for any layout, not only Portfolio layout. Check it out now. To create 1 Layout Overrides type “Menu Items”, we need a xml file and a php file with the same name. In this case, we need to create 2 portfolio.xml and portfolio.php file under the templates/purity_iii/html/com_content/category folder. The portfolio.xml file will consist all the info on Portfolio layout and the parameters for this layout, meanwhile, the portfolio.php is a template layout file. This file has the similar structure with the default.xml file or blog.xml under the components/com_content/view/category/tmpl folder. Similarly, the layout default of the view category, layout porfolio will display these items in a category. In this section, I’ll mainly explain how the data in the Extra fields of the content type Portfoio. * @copyright  Copyright (c) 2006 - 2010 JoomlaWorks Ltd. All rights reserved. From here, we can use these extra fields as other fields in the article. In the portfolio.php file, you can define the CSS file for Portfolio layout. It's the same for other layouts. 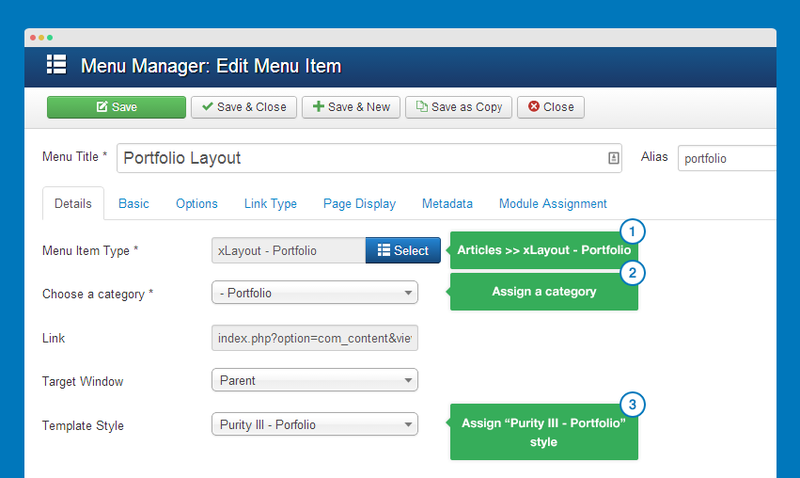 In template manager, create Purity III - Portfolio style, assign the Portfolio layout for this style under the Layout tab. After creating a category named Portfolio and successfully assigned the content type Portfolio for this category, we have to create a menu item using this Portfolio layout. Similar to the Portfolio layout, Purity III provides other layouts such as Magazine, Blog, Feature-intro, Glossary, etc. 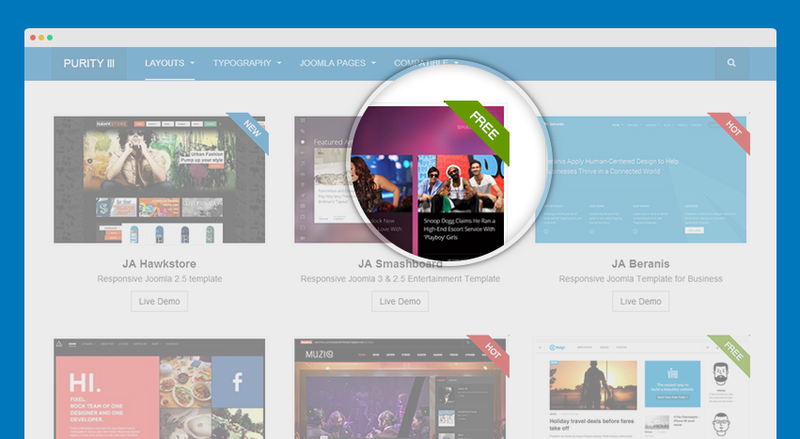 These layouts using the same content type: Article, default content type of Joomla com_content. 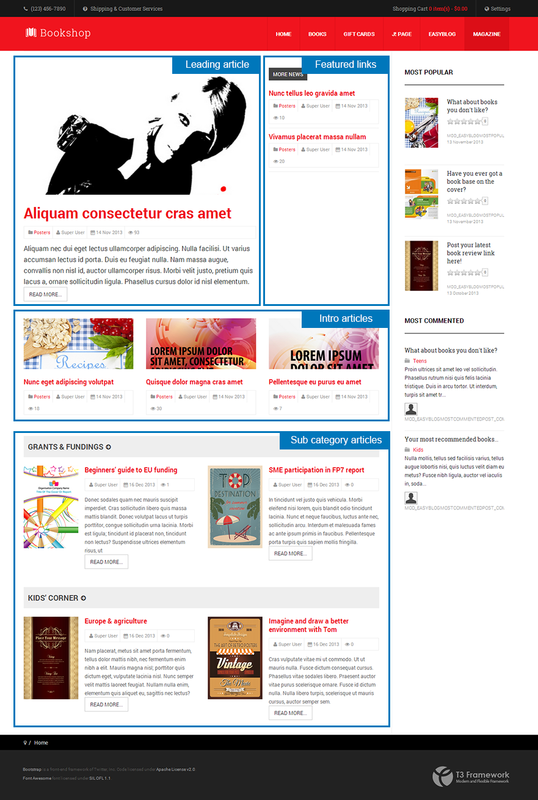 Blog layout consists those files in the Purity III template templates/purity_iii. Layout Feature-intro includes those following files in the Purity III template templates/purity_iii. Looking for layout Overrides in Joomla 1.6? Check it out now. If you are using an other templates developed with T3 Framework, you can move any layout in Purity III to your template. In this thread, we are going to move "Magazine" layout to JA Bookshop - a Joomla template developed with T3 framework. The instruction is the same for other layouts. The template should use base-bs3 (bootstrap 3). Otherwise, you must customize layout & less files to make it work with bootstrap 2. Please move language for Magazine layout. Open your template language file (it should be located in: language/en-GB/en-GB.tpl_ja_bookshop)then add the following language. TPL_MAGAZINE_HOME_FEATURE_CONFIG_LABEL   ="Configuration for Featured articles"
TPL_MAGAZINE_FEATURED_NUM_COLUMNS_DESC   ="Number of columns which to show Feature Articles"
TPL_MAGAZINE_FEATURED_NUM_LINKS_DESC     ="Number of featured links articles"
TPL_MAGAZINE_FEATURED_NUM_LINKS_LABEL    ="# Featured links articles"
TPL_MAGAZINE_HOME_CATEGORY_LIST_CONFIG_LABEL      ="Configuration for category list"
TPL_MAGAZINE_HIGHLIGHT_NUM_ARTICLE_DESC  ="Number of category articles"
TPL_MAGAZINE_HIGHLIGHT_NUM_COLUMN_DESC   ="Number of columns which to show articles for a category"
TPL_MAGAZINE_HIGHLIGHT_SHOW_INTRO_DESC   ="Show Intro text in category list articles"
TPL_MAGAZINE_ENTRY_INTRO_POSITION_DESC   ="Select positions to show Article Info"
TPL_MAGAZINE_HOME_CONFIG_LABEL           ="General Configuration for Magazine Home"
TPL_MAGAZINE_SUB_CONFIG_LABEL            ="Configuration for category layout"
TPL_MAGAZINE_SUB_INTRO_POSITION_DESC     ="Select positions to show Article Info"
TPL_MAGAZINE_SUB_SHOW_INTRO_DESC         ="Show Intro Text in category intro articles"
Create a Joomla com_content category then add articles to the category. The step will help to to compile magazine.less to magazine.css file. Open any template style, then hit the Compile LESS to CSS button. If your template uses bootstrap 2, you may need to customize MARKUP and CSS in .php and .php files. 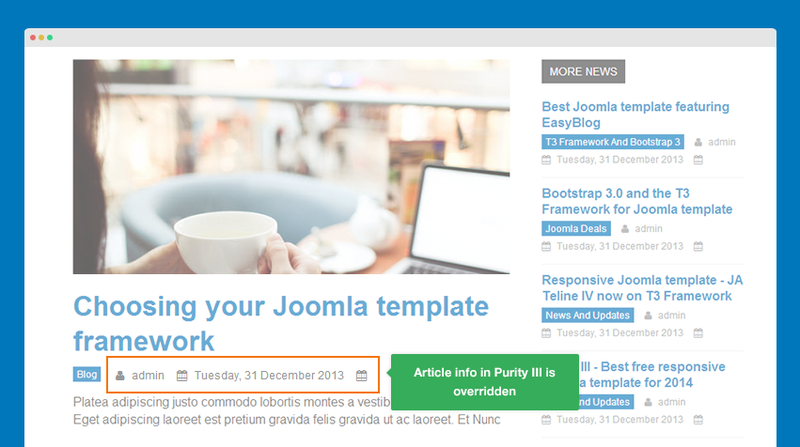 In Purity III, the article info is overriden, so that it has different style in the comparision with default style. If you want to customize any of info, open its file then customize. * @copyright   Copyright (C) 2005 - 2013 Open Source Matters, Inc. All rights reserved. It's the general instruction for all templates developed with T3 framework. In this section, we will show you steps to override Articles Archive module. It's the same for any other module. Create a folder for override module in templates/purity_iii/html, please make sure the folder name must be the same with the one in site_root_folder/modules. In each module, its default layout is defined in default.php file, the file is located in mod_articles_archive/tmpl/. So the easiest way to create override layout file is copy the default.php.